The pond was deeper than she expected. Colder, too. She felt as though she was sliding, sinking, falling down down down to the bottom — wherever that was. A sudden flash of memory swam by — Dr. Seuss and McElligott’s Pool. A kid with a fishing pole and a bottomless pit of water that ends up in an ocean somewhere. Panic set in as it is wont to do when a person is drowning. Her mind stopped making sense. Instead, it fired a final desperate thought: This was how the story ends? Really? “It’s so quiet without our girl,” her father said. “Where’s Alice?” the man asked. The ex-boyfriend turned on his heel and walked out without a word. The bickering continued. It never stopped. Alice had never been able to settle. No matter where she traveled, how many marvels she discovered, it was never enough, because there was always one irritation that she could not shake. Herself. Good, God, she was annoying. Chasing after some elusive thing. She knew well enough what she didn’t want: Children; factory work; city living; an overbearing husband (or an even-tempered one for that matter, nope, no husband at all, chalk it up to her parent’s lousy marriage for scaring her off that one). The list grew longer the older she got. Her problem was she couldn’t decide what it was she did want. Boxes were still stacked in the foyer of the cottage. Her cottage. Her new home. Before she began the task of unpacking, she’d gone to a local market and picked up items for a picnic lunch. Sandwich, chips, some fruit, and a bottle of wine. It was the pond that sold her. 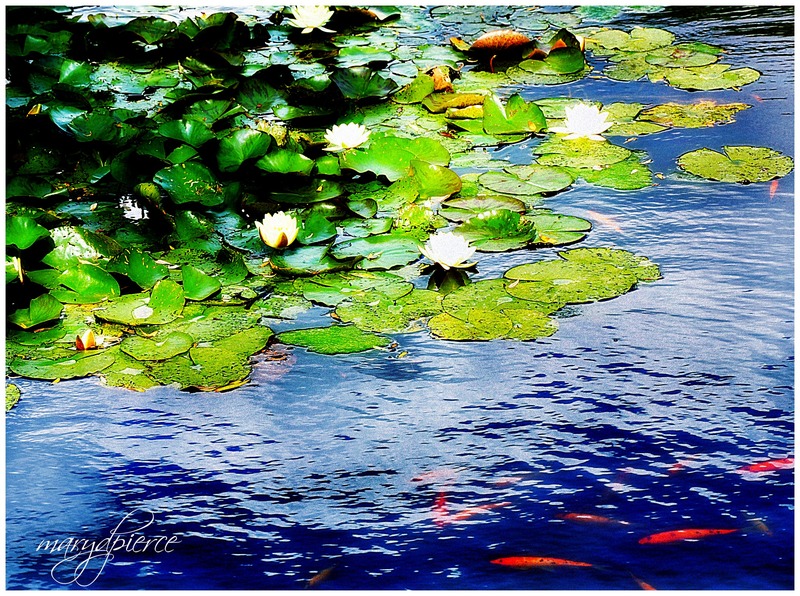 The water lilies spread like a cape over the surface, fish flicking orange tails just below the surface. She hadn’t thought of having a pond until she saw this one. And then, when she did, she knew it’s what she wanted all along. She had one glass of wine. That’s all. Something jumped in the water, and it startled her. She dropped her glass and it broke, cutting her knuckle. Then she accidentally knocked over the bottle and the rest of the wine poured out onto the grass as the bottle rolled the few feet and plopped into the pond. She figured she’d kill two birds with one stone. Retrieve the bottle and wash the blood off her finger at the same time. She thought about a lot of things in her last few minutes. Like how much she was going to enjoy living here. She might even invite her parents for a visit, if they were well enough to make the trip. Definitely put in a garden around the pond. She could do anything she wanted now. After all, she had lots of years ahead of her yet, didn’t she? n.b. The object of this DP Weekly Writing Challenge was to begin a story with the end. It sounded like fun. It was fun to figure out. I hope you like it. Mary, I read this yesterday and had to came back today to read it again. It makes me sad that Alice finally got something she wanted and then drowned. Bummer indeed! No apologies, Mary! Just think how great it is that your writing sparks such interest and emotion. I certainly couldn’t do it! There are myriad fascinations to your stories. I always wonder where- and if- life is imitating the art inside a conversation or a character or a scenario. Next, I wonder where the first spark of your latest idea came from. And then I wonder this and then I wonder that, and then I get lost in the wilderness of the words. You paint the simple words with the finest brush, lady. Your reads are always a great trip. First spark was the photo. I had been playing around with it when I read the weekly challenge and thought – hmm. . .
Second spark was a quote about time from Alice in Wonderland; third spark came from thinking how deep the pond could be and remembering the Seuss book. Also, I have a morbid fear of drowning. I don’t know why. I grew up near water and am an excellent swimmer. Not very nice of me to drown that poor clumsy woman (I’m kind of clutzy now that I think of it). There you have it. The inside of my head in two paragraphs. need to think and re-read… will be back… much to think about. Does it help if you read my explanation in the comment above? Strange little story, I know. Thank you so much for reading. I appreciate it. I adored this, Mary, as I do all of your writing. I enjoyed the dialogue, and I grinned at your including: “Does a donkey bray?” because it made me think of baby donkey. And of course, I have shared Alice’s “dammit” when I dropped a wine bottle or two or one hundred in the past. And when the story was over? I shared Alice’s “bummer” as well. Ha! That line was just for you, Christy! I was thinking of baby donkey when I wrote it. It was the perfect retort. I almost linked to your post about donkey, so that you would know it was meant for you, but I thought it would confuse people even more than they probably already were by my story. I have spilled many a glass of wine (and milk) and said “dammit” (and worse). I am a little clumsy myself, though I hadn’t consciously worked that in. I didn’t think about it at all until I was explaining the seeds of story for Cayman. Interesting how our minds work. And THANK YOU for adoring it. That’s so nice of you! Haha! I loved the hidden-in-plain-sight donkey gem for me, thank you! I LOVE little winks like that. And goodness can that little thing bray! He has got some pipes on him already. That’s my next challenge–trying to catch him “singing” on video. He’s such a happy boy. I think what grabbed my attention most here is how you’ve humanized Alice. For a brief moment, as you were describing her inner complications, I felt as though I was the one being spoken about. You managed to breathe life into a 2-D character. Good on you, a nice light read. Whow! I am breathless! But I think the end mustn’t necessaryly be THE end. Usually live is that blunt. But sometimes in books life hands you a surprise after the surprise. Thinking positive it would. Could be the beginning of a loooong exciting story of Alices very mature way to deal with people like parents. You are such a good writer, my fantasy is always kicked loose like an avalanche….. Thought of you and this story when this song came up on shuffle. It’s a little bit Alice, a little bit Cathy Ames, and a lot delicious. Christy, I LOVE this song! It’s perfect. Thanks for linking it. Intriguing, isn’t it? Of course, you have to read the book to find out what happened, and (spoiler!) the narrator doesn’t die. I was thinking along the same lines for my story. I love your idea of another reflective looking glass. Thank you, my wonderful, creative friend!! Love the story and the pic!